Muhammad Akashi, Efrat Sabach, Ohad Yogev and I suggest that clumpy-dense outflowing equatorial rings around evolved giant stars, such as in sup ernova 1987A and the Necklace planetary nebula, are formed by bipolar jets that compress gas toward the equatorial plane. The jets are launched from an accretion disk around a stellar companion. The jets account also for the presence of a bipolar nebula accompanying many of the rings. See Paper. I show that the circumstellar matter of the type Ia supernova 2014J is too massive and its momentum too large to be accounted for by any but the core-degenerate scenario for type Ia supernovae. I conclude that if the absorbing gas originated from the progenitor of SN 2014J, then a common envelope phase took place about 15,000 years ago, leading to the merging of the core with the white dwarf companion, i.e., the core-degenerate scenario. Else, the absorbing material is of interstellar medium origin. Paper was posted on astro-ph. Efrat Sabach and I proposed a scenario for the formation of the pulsar with two white dwarfs (WDs) triple system PSR J0337+1715 where a close binary system is tidally and frictionally destroyed inside the envelope of a massive star that later goes through an accretion induced collapse (AIC) and forms the neutron star (NS). The proposed scenario includes a new ingredient of a binary system that breaks-up inside a common envelope, employs an efficient envelope removal by jets launched by the compact object immersed in the giant envelope, and the newly proposed grazing envelope evolution. Paper was posted on astro-ph. 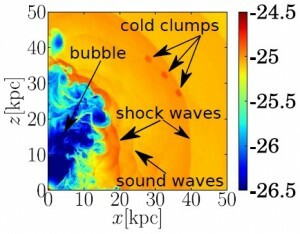 Avishai Gilkis and I show that turbulence in core collapse supernovae which has been shown recently to ease shock revival can also lead to the formation of intermittent thick accretion disks, or accretion belts, around the newly born neutron star. This is likely to result in jets that explode the star. We strengthen the jittering jets mechanism as a prominent explosion mechanism of massive stars. Paper was posted on astro-ph. Using three independent directions, Danny Tsebrenko and I estimate that the fraction of type Ia supernovae (SNe Ia) exploding inside planetary nebulae (PNe), termed SNIPs, is at least 20%. 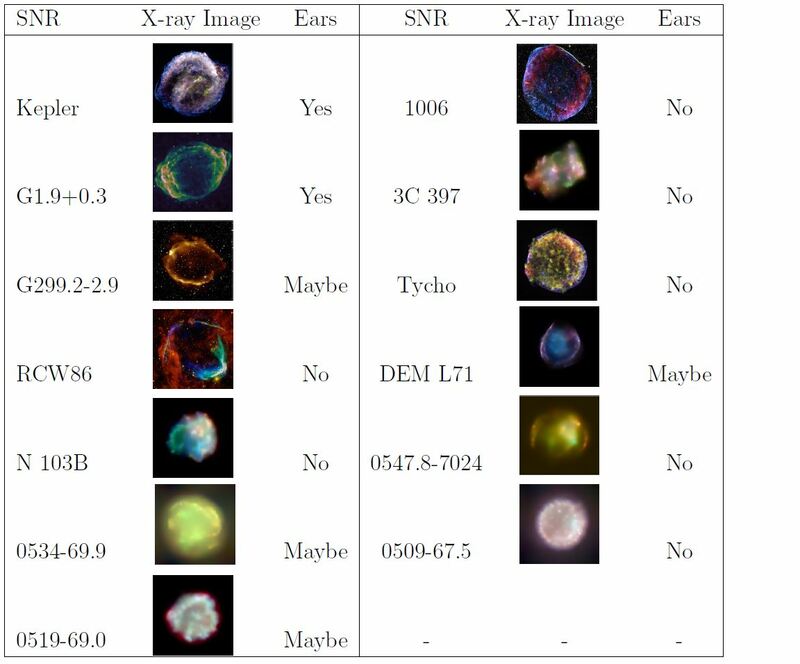 One method was to examine well-resolved supernova remnants where we identify the morphological feature of two opposite `Ears’. We attribute the Ears to features formed during the planetary nebula phase. Below are images taken from the Chandra SNR Catalog where we marked those with Ears. Paper is on astro-ph. I suggest the Grazing Envelope Evolution (GEE) as an evolutionary channel that can replace in some cases the common envelope evolution in forming close binary systems. In the GEE the binary system might be viewed as evolving in a constant state of `just entering a CE phase’. The GEE is made possible only if the companion manages to accreted mass at a high rate and launch jets that remove the outskirts of the giant envelope. The GEE lasts for tens to hundreds of years. Paper is on astro-ph. Using 3D numerical hydrodynamical simulations, PhD student Danny Tsebrenko and I have shown that a type Ia supernova explosion inside a planetary nebula can explain the observed shape of the G1.9+0.3 supernova remnant, and its X-ray morphology. Paper is on astro-ph. With student Naveh Levanon and Enrique Garcia-Berro (Universitat Politecnica de Catalunya) we followed the mass blown during the WD-WD merger process in the Double-Degenerate (DD) scenario for type Ia supernovae (SN Ia), and find that the interaction of the SN ejecta with this wind affects the early (<1 day) light curve in a way that may contradict observations, if the detonation occurs during or shortly after the merger (<1 day). Paper is posted on astro-ph. over the last decade with former postdoc Fabio Pizzolato. Paper is posted on astro-ph. 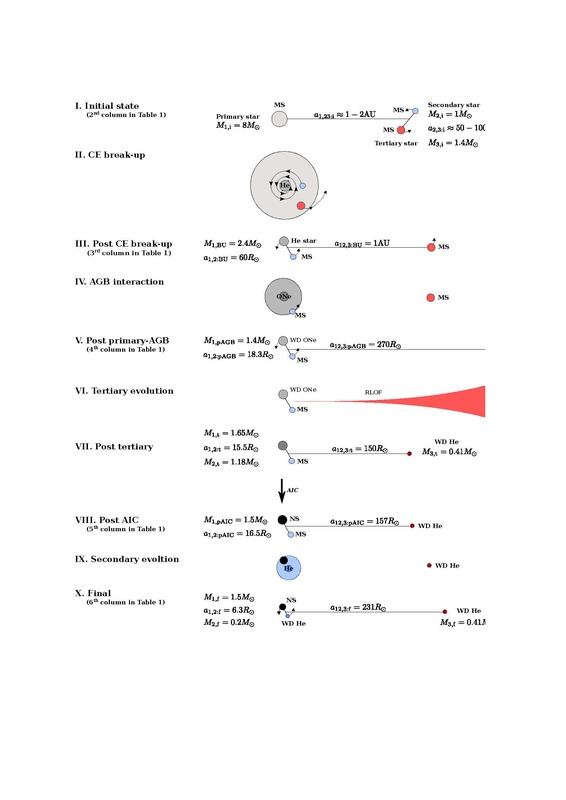 Efrat Sabach and Noam Soker examine rare evolutionary routes of binary systems where the initially more massive primary star forms a white dwarf (WD), while the secondary star accretes mass from the evolved primary and later terminates as acore-collapse supernova (CCSN). 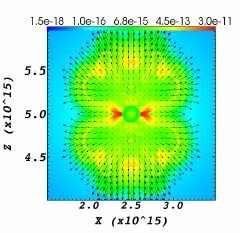 In such a WD–NS (neutron star) reverse evolution a NS or a potential NS-progenitor massive core is formed after the WD. These SN explosions are likely to be preceded by strong interaction of the WD with the giant secondary’s core, leading to an Intermediate-Luminosity Optical Transient (ILOT). Paper published in MNRAS.